We can't argue with it. Halloween is a pretty dark holiday. People get scared all the time, it takes place at night, and there are dead people all over the place! We're pretty sure it's the darkest holiday out there (We mean, have you seen Nightmare Before Christmas?) Just watch any Tim Burton film and you'll understand what Halloween looks like. In fact, that reminds us of something. You're probably going to need a lot of black makeup to create the best look for the dismal festivities. 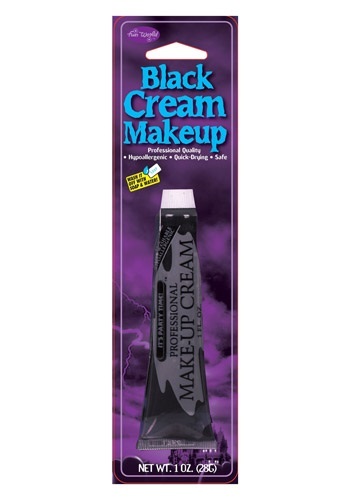 Why not go pro with it with this Professional Black Cream Makeup for your next zombie outfit? This cream provides a perfect base to really cast shadows where they need to be and contrast anything else you wear. Grab some white makeup and shade this is for a great fresh from the crypt corpse look! CAUTION: makeup can stain fabrics, so be careful when applying it and until it dries. We recommend wearing old clothing such as a t-shirt and old shorts when applying and waiting to put on the rest of your costume.